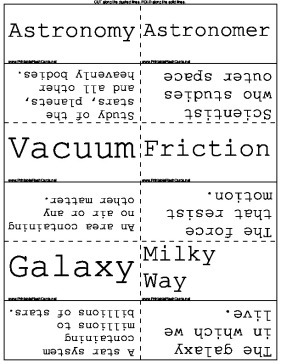 Astronomers will enjoy learning about the planets, stars and moons in these printable flash cards. Astronomy Study of the stars, planets, and all other heavenly bodies. Vacuum An area containing no air or any other matter. Friction The force that resist motion. Galaxy A star system containing millions to billions of stars. Milky Way The galaxy in which we live. Local Group The cluster of about 40 galaxies that includes the Milky Way. Barred Spiral A spiral galaxy in which the spiral arms are attached to a straight "bar" that runs through the center of the galaxy. Nebulae Large clouds of gas and dust in space. Constellation The stars outlining and imaginary picture in the sky. Axis of Rotation An imaginary line that stretches from pole to pole through the interior of a planet, around which the planet rotates. Photosphere "Sphere of light" visible surface of sun. Sunspots Darker spots that move slowly across the face of the sun as the sun rotates. Solar Eclipse When the earth's moon passes in front of the sun, blocking the sun's light. Chromoshpere Part of the sun's atmosphere closest to the sun's surface. delicate pink or orange color. "sphere of color"
Corona A haze of very hot gases that extends hundreds of thousands of miles from the surface of the sun. Nova An occurrence when a star suddenly flares up to many times its original size. Atmosphere The blanket of air that makes the earth hospitable for living things. Ozone Layer A region of atmosphere that filters most of the harmful ultraviolet radiation from the sun. Located between 10 and 30 miles above the earth's surface. Greenhouse Effect The ability of the earth's atmosphere to retain heat around the earth. Maria "Seas:" large, dark plains on the surface of the moon. Electric Field A region in which certain objects may be attracted or repelled by an electric force. Wave a movement of energy from one place to another.